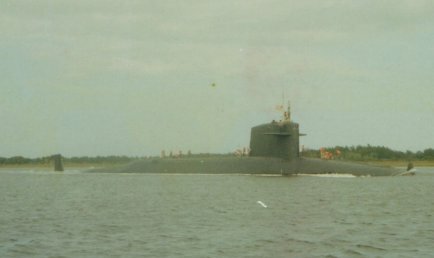 At the entrance to Chesapeake Bay, just off Norfolk, VA, I had a fascinating, if not scary, encounter with a nuclear submarine, one with all the missile hatches aft of the conning tower called a "Boomer." At first, I noticed a large wave on the surface of the water travelling at high speed less than about 1/2 mile away. I was totally mystified. Then I saw the conning tower and realized what it was. I was very aware of the fact it was headed straight for me. I changed course to go at right angles to its direction. The submarine also changed course slightly and passed about 500 yds. away but I would be surprised if it was doing anything less than 20 knots. The impressive thing was the size of the wave it pushed over itself, and the fact it was totally silent. This is a must stop for anyone cruising the Chesapeake. 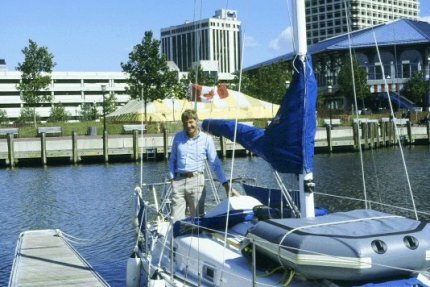 At a cost of millions of dollars a small inner harbour was constructed and surrounded by an International Shopping area, a Science Center, a huge aquarium, a submarine exhibit, the USS Constellation and live bands most evenings. 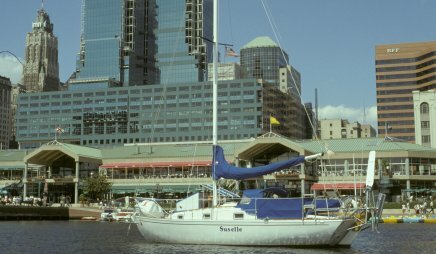 Cruising sailboats are allowed anchor in the inner harbour for free and to stay as long as they want. It was a super place to spend a few days. I met a number of other cruising sailors, one couple who had just completed a circumnavigation, and another couple just about to start one. The latter couple I got to know well and we sailed together for the next few weeks, including a visit to Washington, DC. The sail up the Potomac River to Washington is a long one - it is 120 miles from the Chesapeake Bay. But I think it was well worth it. You can anchor for free just three blocks from the White House and the Smithsonian. The marina there provide free showers and free use of their dinghy dock for visitors - I think because they are so thrilled that a visitor would make the long trek up the Potomac . I spend two weeks visiting the Smithsonian - totally fascinating - and had a special tour of the White House thanks to a cruising friend I met who was retired from the Air Force. Norfolk is fascinating. I have never seen so many large navy ships and submarines sitting side by side for what seemed like miles with ships on both sides of the river. It is an incredible site. I had to stay clear of a huge aircraft carrier making its way slowly down the center of the river. The area is very nice and the place I stayed for the night was delightful. I also saw the largest dry-dock in the world on my way to the Intracoastal Waterway.